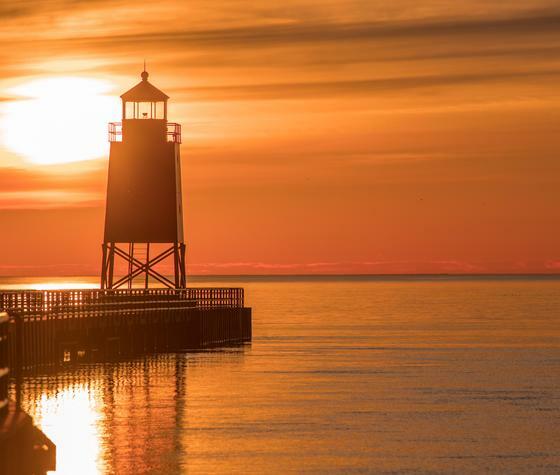 It's no secret that life is better on the water, which is one of the reasons avid boaters and paddlers flock to Charlevoix. Charlevoix is set on Lake Michigan, Round Lake and Lake Charlevoix which connect around the downtown shopping district. Enjoy the scenic beauty of the waters from land or get a closer look via watercraft. Whether you bring your own boat or need a rental, vast expanses of freshwater are just waiting to be explored. Lake Michigan and Lake Charlevoix offer visitors and residents the opportunity to enjoy great freshwater fishing, water sports, kayaking and stand up paddling. Equipment rentals are available at area beaches. There are numerous marinas in the Charlevoix area that offer private charters, boat tours, and sunset charters along Lake Michigan. Boating in Charlevoix is a great way to experience the award-winning waters of the area! Lake Charlevoix- There is a reason Lake Charlevoix was rated the second best lake in the country by USA Today readers. With 17,200 acres of beautiful clear blue water and 56 miles of shoreline, this lake provides endless opportunities for swimming, water sports, cruising, fishing, and house gazing. On the end of each arm, visit the towns of Boyne City and East Jordan for shopping and dining. The Landing in Ironton provides relaxation, food a drink with a view of the historic Ironton Ferry. Round Lake- Picturesque Round Lake is the bustling center of activity for boats going to and from Lake Charlevoix and Lake Michigan. Downtown Charlevoix, East Park, historic summer clubs and beautiful homes overlook this body of water. Lake Michigan (aka The Big Lake)- The vast water of Lake Michigan connects Charlevoix to anywhere in the world. The sparkling water stretches as far as the eye can see and sometimes is mistaken for an ocean, but in fact, is completely freshwater. Walloon Lake- Known for the Carribean like blue waters, Walloon Lake lies 20 minutes northeast of Charlevoix. Hemingway spent his boyhood summers near this treasured lake. Torch Lake- This nationally recognized gem is a boaters paradise. Torch Lake is 19 miles long and 285 feet deep making it the second largest lake in Michigan and a favorite of boat enthusiasts. Antrim County Northern Chain of Lakes- These hidden gems connect Six Mile, St Clair, Ellsworth, Wilson, Hanley and Central Lakes. Known for sighting wildlife and fishing, these lakes make for water relaxation at its finest. Thank you for visiting https://www.visitcharlevoix.com:443/Boating! Be sure and revisit visitcharlevoix.com frequently for content updates and more.